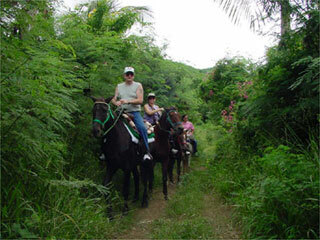 It is advisable to book your horseback tour at least two weeks in advance, or a month in advance if around the busy Christmas season. 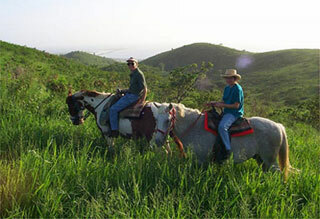 Have your taxi take you to Paul and Jill's Stable, on Route 58 ("Creque Dam Rain Forest Road"). We are the third driveway on the left, and there is a "Paul and Jill's" sign on our gate post at the foot of our driveway. For cruise ship passengers, rides are scheduled in the late MORNING. You will be given a specific check-in time when you make your reservation with us. In the event that the morning ride becomes full, and if there is sufficient demand we may open an additional mid-day ride. We are located just a five minute taxi trip from the Frederiksted pier. You must walk off the pier to grab a taxi. (The taxis on the pier are only for the tours that were pre-booked on the ship). If you have any trouble finding a taxi, ask for help from the Tourism Office at the end of the pier. The price of a taxi can be $6.00 to $10.00 US per person, one way. We suggest you arrange to have the same taxi driver return to pick you up at our location or from the Sunset Grill beach restaurant, which is just five minutes away. Note that it is at least a 30-40 minute walk back to the pier should you prefer the exercise. If you are planning to go to the beach after the ride, you may store your beach bags in our locked saddle room while out on the ride. It is only a short five minute walk down to the beach. For aspiring snorkelers, you can rent gear at one of the dive shops on Strand Street before catching a taxi to our stable.